NOTES: The July-August program begins just after the World Cup on July 15th in Rio de Janeiro. Students should arrive early in the morning on this date, and be ready for a welcoming opening ceremony at 2pm. 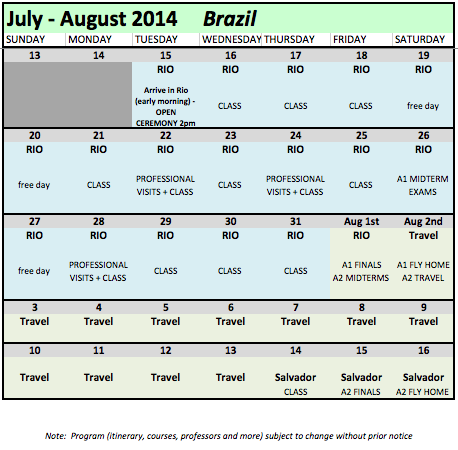 Students in the A1 session should plan on flying home from Rio de Janeiro at anytime on August 2nd. Students in the A2 session should plan on flying home from Salvador (Bahia) at anytime on August 16th.